After concentrating on troughs in last week's bulb log this week I will bring you up to date with which bulbs are flowering. I will cover landscaping and planting up the troughs in a future log and I have also posted many more detailed pictures of the troughs in the forum if you are interested. 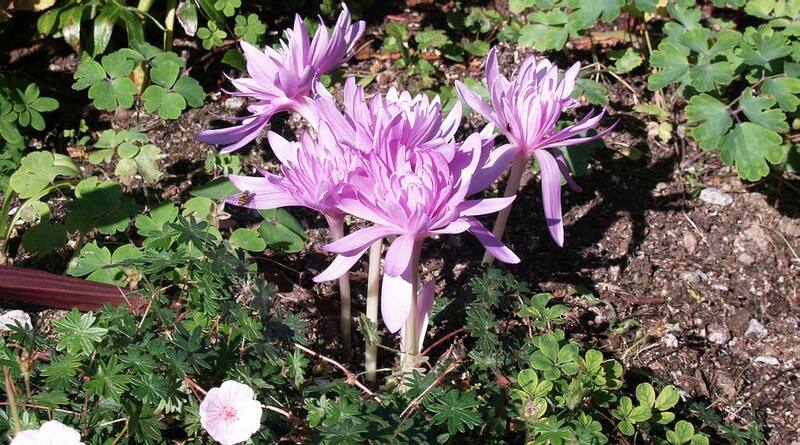 Love it or hate it Colchicum 'Waterlily' is here to stay because it is a robust cultivar and increases steadily. 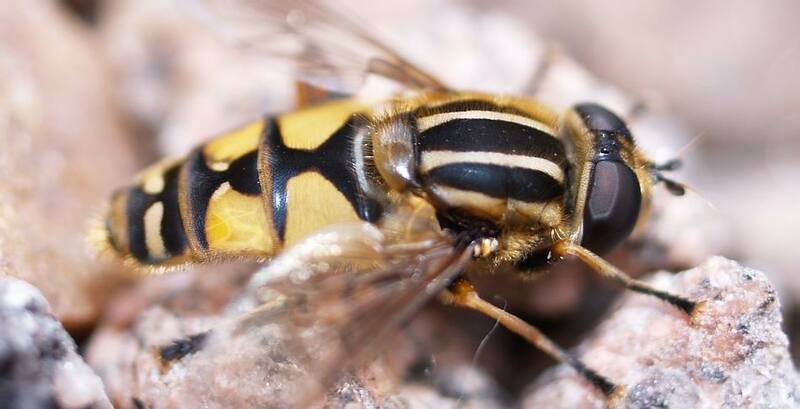 It does seem to attract the hover flies just as much as the normal forms do- you can see one on a petal. I found another one having a rest on the gravel top-dressing of a pot and I managed to stalk it long enough to get a close picture. Unfortunately it did not stay long enough for me to get my tripod which would have allowed me to shut my lens down to f22 and get a better depth of field. 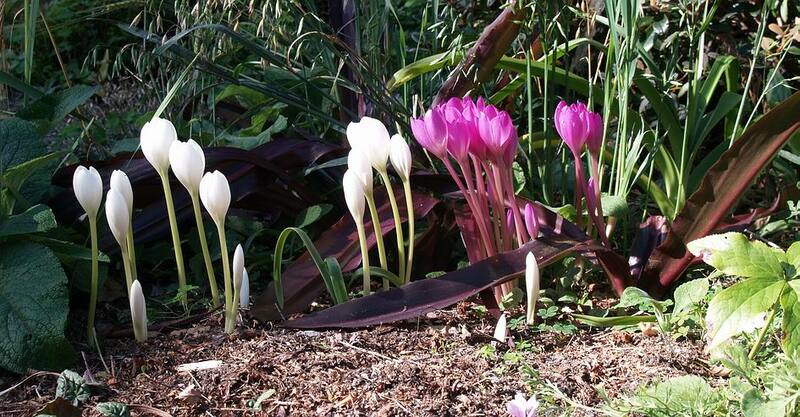 Much more to my taste than the multiplex forms are these beautiful flowers of Colchicum speciosum album and a dark hybrid - they are really showing off well in some of the sunny days we are at last enjoying. 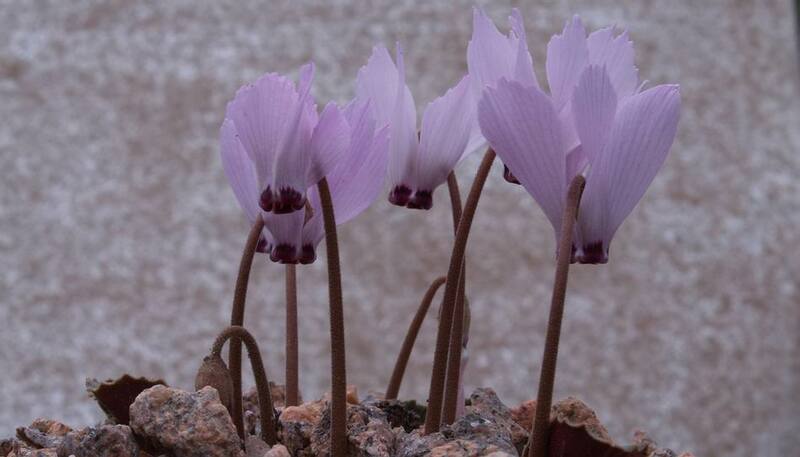 A number of weeks ago I showed the very first Colchicum montanum flowering in the bulb house - now in the same pot a number of other clones are coming into flower showing that it is not just the looks that can vary but also the flowering times. 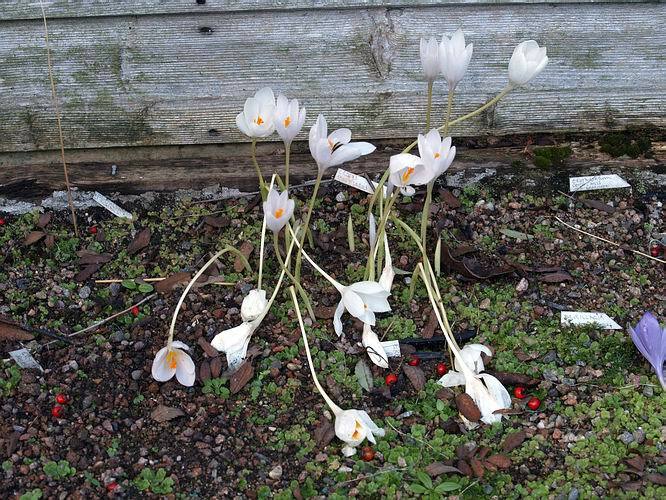 Back outside to the Crocus this time and a group of Crocus nudiflorus 'Orla' is looking very battered by the weather. 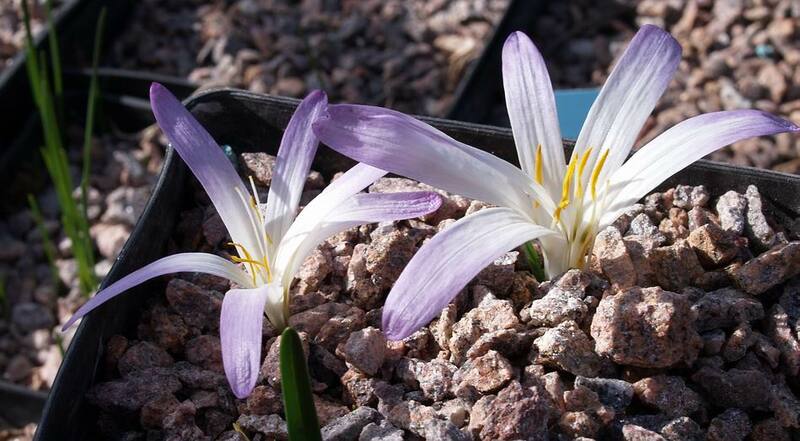 Unfortunately most of the autumn flowering crocuses in the open garden get a rough time from the weather but I still like to see them and I always keep some of each species under glass where usually they stay more compact and do not get flattened. 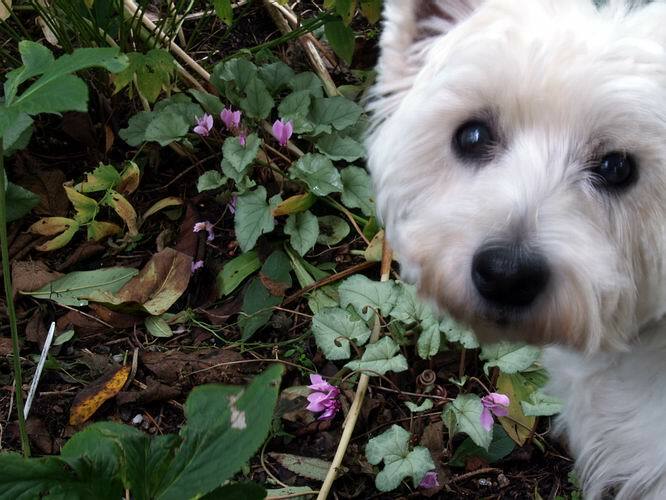 The flowers of 'Orla' have a violet tinge when they first come out but that quickly fades and then they are pure white. 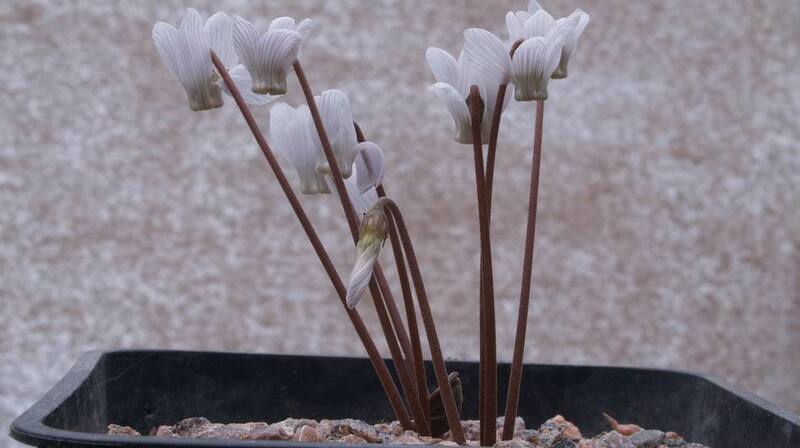 I now have a number of other white seedlings of Crocus nudiflorus which open white but they tend to flower later so I will show them when they begin. 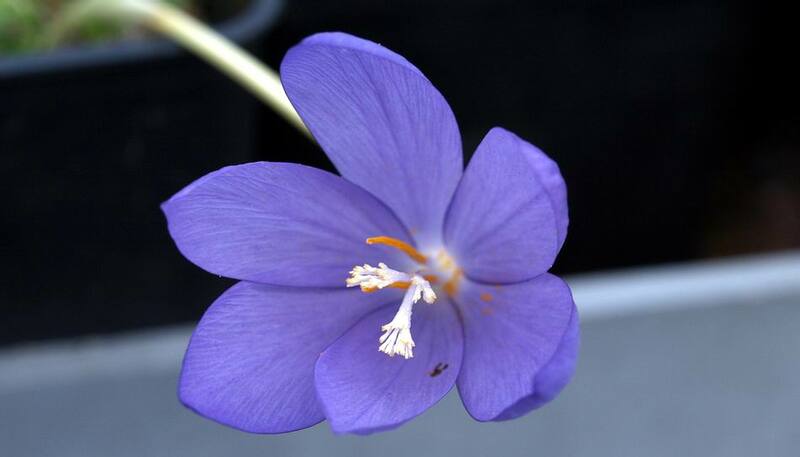 An interesting seedling that I raised is Crocus nudiflorus with a white stigma and this is a seedling from that plant so this attractive feature can be passed down the seed line. 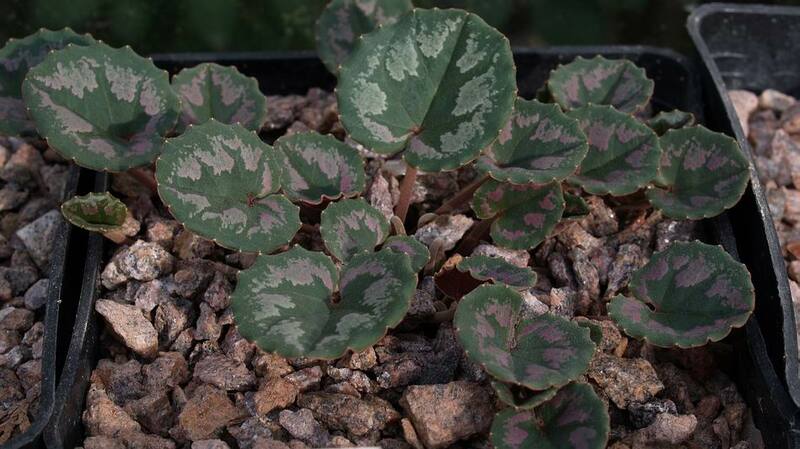 These are a number of Cyclamen hederifolium silver leaf form seedlings I planted out a few years ago and they are starting to establish well under some Acer palmatum trees. Taking the photographs is not always incident free when my assistant is around - "what are you doing that for- you should be speaking to me!!" 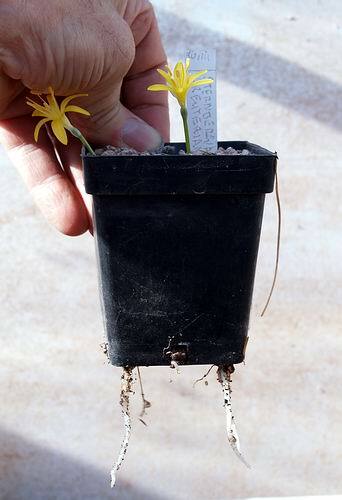 One of these seedling plants has mutated white flowers. 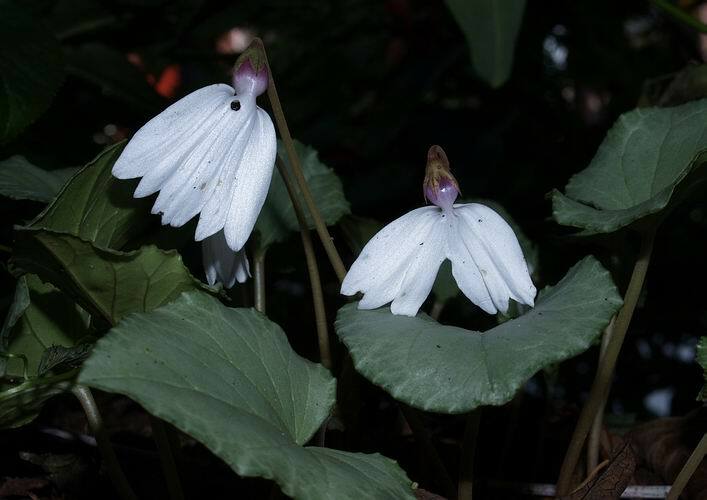 The petals are joined all the way down so they cannot reflex and since they are not joined into a circle they form a fan shape. Here is the reverse view of a flower. As all the flowers on this plant are like this - I suspect that this is a genetic mutation- I will have to watch out and see if they do the same next year. 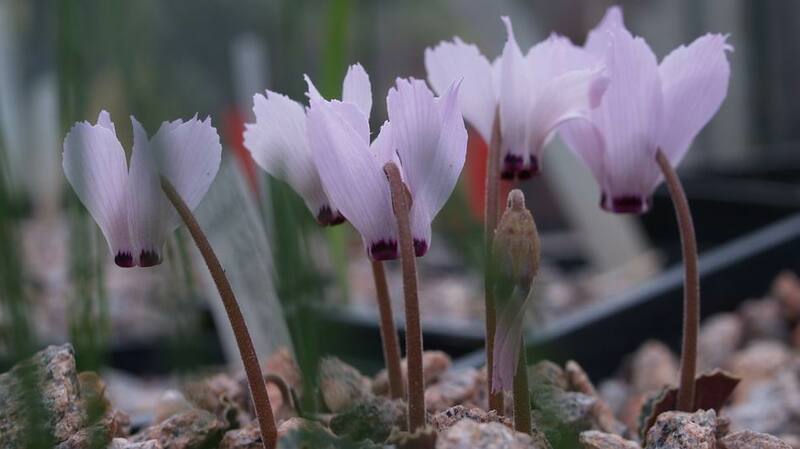 In the bulb house my favourite Cyclamen are coming into flower - they are the small ones like this Cyclamen intaminatum. 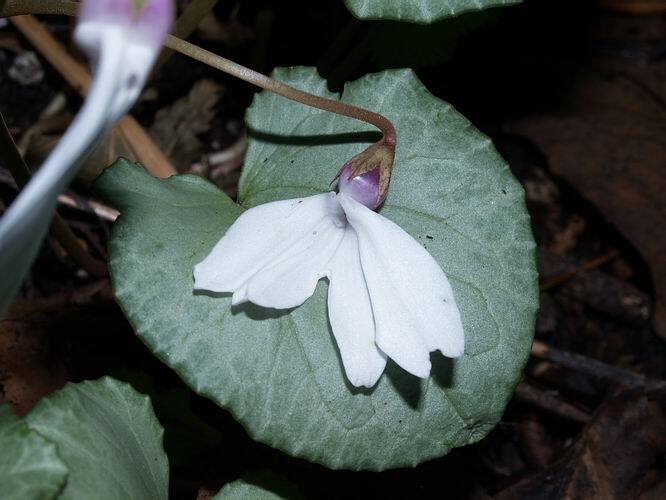 And the closely related Cyclamen mirabile slightly larger than C. intaminatum and with beautiful pink flowers. Here is another seedling that starts to flower before the leaves appear but I can explain that simply, as it is one of my own seedlings and the corm is planted about half way down the pot - I bought the pink leaved form some years ago and repot it so the corm lies on the surface and is just covered with gravel. 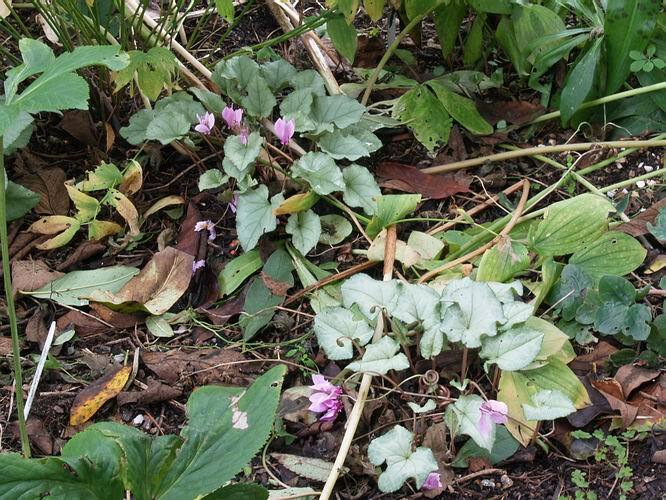 I always sow my Cyclamen seed half way down the pot and continue to repot the corms at the depth that I find them. I am never sure if I should suddenly plunge a corm that has always been grown on the surface down to that depth and I am not going to risk a beautiful form like this. 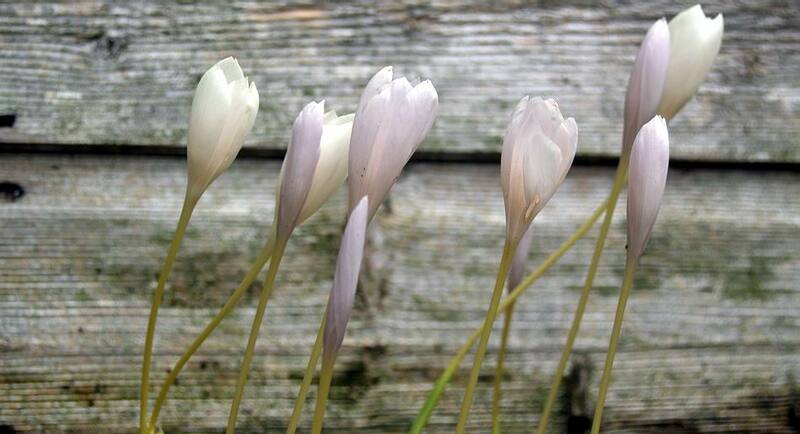 Any how when the corms are planted deep the flowers are more likely to come before the leaves and vice versa. 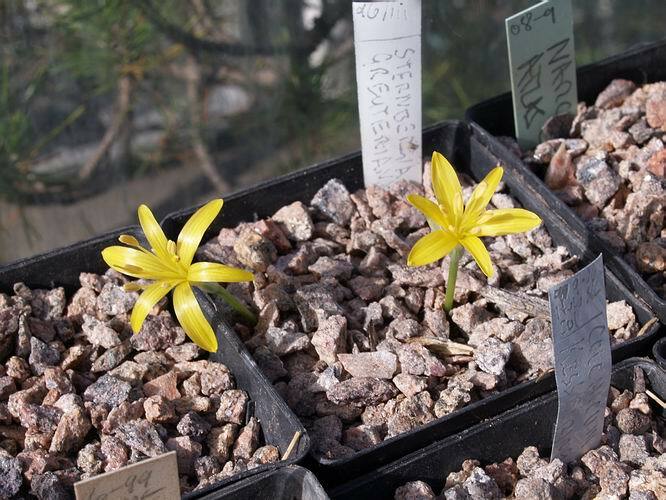 The tiny Sternbergia greuteriana is in flower again and it is a wee beauty. It is often very difficult to get a good photograph of the bulbs when the pots are in situ but I am never happy moving them when they are in growth. I did decide that I could risk moving this pot of Sternbergia greuteriana - as it was so small I thought the roots will not have grown too much yet. Well how wrong can you be - the roots are well extended and there was much careful excavation of the sand plunge and careful watering to ensure the roots were well washed in and undamaged after this. 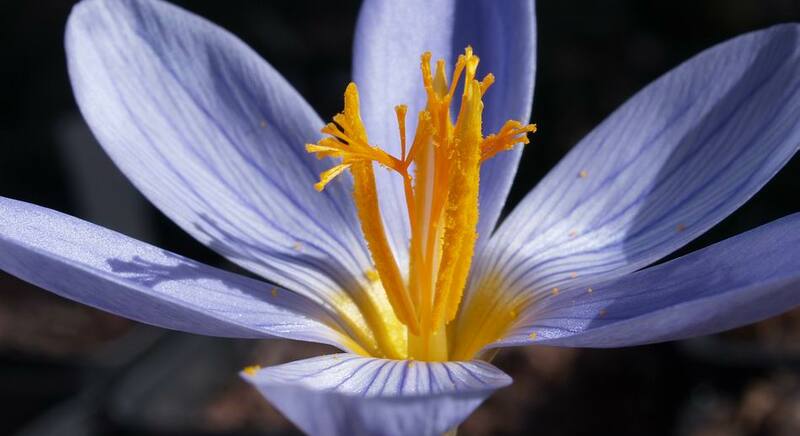 The first flowers of Crocus speciosus xantholaimos are in flower and many tips of growth are appearing in the crocus pots so there is much to look forward to in the coming weeks.